Arms: Or within a voided hexagon an annulet both per pale gules & azure between 3 taucrosses gules a bordure engrailed azure. Crest: A griffin segreant gules armed langued and winged Or in the dexter foreclaws a bird-bolt bendwise sinister azure & flighted Or the head upward and in the form of a fleur-de-lys azure and supporting with the sinister foreclaws an anchor Or. The red and blue of the hexagon refers to the grantee's postgraduate research on coloured derivatives of the benzene molecule. The tau crosses allude to Mr Ryan's Christian name. 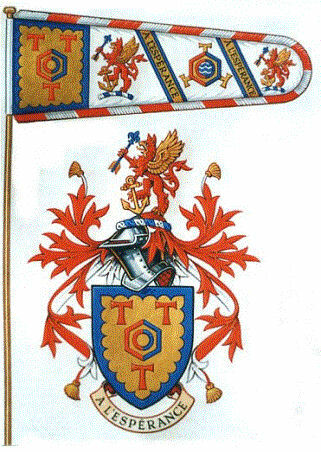 The crest reflects Mr Ryan's family background. The griffin is taken from that used by the ancient Irish sept Ryan. The bird-bolt stands for maternal connections with the Hales family who also had French relatives, hence the fleur-de-lys tip to the bolt. The anchor and wreath (of blue and silver) reflect a sea-going tradition within Mr Ryan's family, four generations of which have been master manners.